The EzineArticles Formula Debuts Tomorrow! Now includes 5 FREE WEEKS of Premium Membership! Recently we’ve been sharing bits and pieces of information about the 10-module, step-by-step training system designed by the article marketing coaches here at EzineArticles. Tomorrow is the day you’ll all be able to start ordering this A-Z article writing and marketing training system. From day one, our goals with The EzineArticles Formula have been to help new authors get started with their article writing and marketing efforts and help those in the beginner-to-intermediate stages take their efforts to new heights. If you fall into one of those two categories, this package is for you. Upon ordering, you’ll immediately gain access to the first weekly installment of the course. Then, over the following 4 weeks, we’ll be adding additional components for you to download as you work your way toward becoming a true Expert Author. 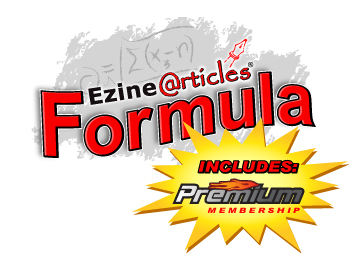 We wanted to create even more value for EzineArticles Formula owners, so we are also including 5 weeks of Premium Membership with your order. This is a $121.25 value! SPEED: Your articles go to the front of the line to be reviewed before non-Premium level member article submissions. SPEED: Your article submissions are reviewed by a senior-level member of our Editorial team. SPEED: Your email questions to our Member Support ticket center go to the front of the queue for priority response. CONTROL: Submit all of your articles at one time and choose when each will be published with our Scheduled Release feature. INTELLIGENCE: Access the top 30 keyword/keyphrase traffic search terms used to find your articles. CONVENIENCE: Store up to 12 different resource boxes to attach to your articles. Premium Membership will help to further accelerate your learning curve with increased speed, control and intelligence. For that reason, EzineArticles Premium Membership was a perfect add-on to the already robust EzineArticles Formula package. If you’re serious about adding article writing to your marketing toolbox and want to get a better understanding of how to get the most out of your efforts, go to EzineArticlesFormula.com, and order this training system tomorrow, starting at 12PM, CST. We released it Tuesday at $897 via a 3-pay plan and $797 via a 1-pay plan. I have been wanting to purchase a premium account from EzineArticles for awhile now, but I am not the best writer. Now that they are offering an A-Z article writing and marketing course to help people with their writing I am going to purchase the course. I am very excited. I must say that having my articles published by EzineArticles has definitely improved my website authority on the Internet but I don’t make sufficient use of all of the opportunities that being a member is offered. I therefore look forward to this great opportunity but like Angela I hope that the cost will not be prohibitive for those of us who operate small businesses. Nevertheless I shall put my name down with eager anticipation. I am glad to see that many of you are as excited as we are about the release of The EzineArticles Formula at 12pm, CST today. A few of you had questions on the price. We have 2 payment options for The EzineArticles Formula. The first is to pay in one installment of $797, which is $200 off the market value price of $997. This is the best value. We do have a great option to consider for those that are in the beginning stages of getting their businesses off the ground. You can pay $897 for the course and have the luxury of spreading your payments over three months in three easy installments. Check out http://EzineArticlesFormula.com at 12pm, CST today to order. As an update to Rob’s comment, it’s now $397 USD thru Midnight CST, Tuesday December 14th… and then it’s off the market while we deliver the class. Well, I was really excited about the course until I saw the price. That is too rich for me. I was hoping it was going to be more affordable, I am just starting out and I can’t afford that price. I guess I will have to wait. I have always felt that contributing articles to EzineArticles.com is one of the best traffic generation techniques for most niches. This EzineArticles formula sounds like the next logical step. Sounds like a great training program. Little curious of cost? – I do like the keyword feature or acess to this SEO feature. if you do the payment plan, when will you receive access to the program? Mark, access is given immediately upon receipt of the first payment.